When The Italian Sea Group signed the contract for the Tecnomar 30 superyacht Zahraa in 2012, it chose to build the yacht in GRP – making her the last GRP yacht to be launched by the Italian marque. 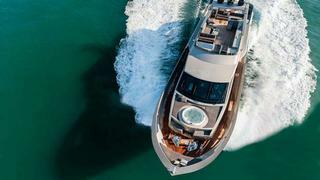 However, styling details and a revamp of the design mean that this yacht is less a throwback to the past and more a statement of intent for the future. The new smallest yacht in the Admiral Tecnomar lineup, Zahraa immediately differentiates herself from her superyacht predecessors with a new look and a new line to her profile. Large cutaways in the main deck bulwarks not only open up the view from her main saloon, but also set the trend for the new lines coming from The Italian Sea Group’s design boards. Moreover, that chiseled profile smacks of a modern approach, making her distinctive in spite of her obvious DNA. ‘We’ve decided to say goodbye to GRP construction,’ says Pennacchio, ‘but in a different way.’ Although the future plans of the Italian Sea Group are for every model – from the smallest at 30 metres to the largest at over 60 metres – to be built in aluminium or steel, that strategy had not been finalised when construction began on Zahraa and she retains the GRP construction of her sisters. The owner also chose to prioritise insulation over outright performance. 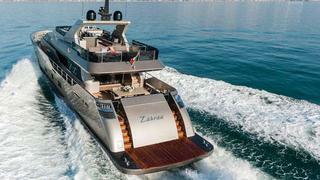 Built for the Middle Eastern waters where she will be based, Zahraa’s interior design is completely custom. She was drawn by Tecnomar Centro Stile in collaboration with her owner, and features a host of precious materials in her finish including backlit onyx for the main saloon bar, Brazilian marble for the sinktops, and zebrano wood. Her layout too deviates from the norm for the old Nadara 30, with a longitudinal en suite fronted by glass in the master to retain the impression of a full-beam cabin amidships on the lower deck. 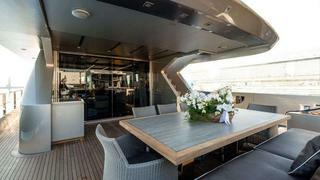 She also features a forward VIP and two double/twin cabins for guests. 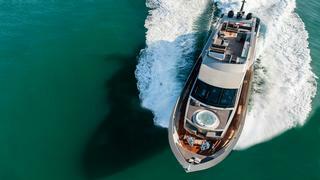 ‘The client wanted an elegant yacht that was modern, but not too modern, and that was not too classic but which had some really classic elements,’ says Pennacchio. ‘He asked for a really nice, big space inside, and a lot of comfort especially in the saloon.’ The technical spaces and crew areas are pretty much the only elements that have not been changed over earlier versions. The hull and technical spaces are largely unchanged from the earlier Nadara 30 launches, although the client’s brief for maximum comfort at the expense of a knot or so of speed led the design team at Admiral Tecnomar to make specific studies using finite element analysis. The boat was designed to obtain a semi-planing condition with a max speed of 22 knots and a cruising speed of 19.5 to 20 knots. The yard consulted with [classification society] RINA’s noise department, and the effort is borne out in the result – sound levels range from 38dB to 46dB, with an average of 42dB.